What are the risks to investing in Lending Club stock and is investing in peer loans a better investment? I first looked at the tradeoff between investing in peer loans versus Lending Club stock in December 2014, just as the company was issuing shares. At the time of the IPO, shares soared to almost $25 per share and well over my fair value estimate. On that basis, I decided it was much better to invest in peer loans and wait for Lending Club stock to come down to a better value. Since then, shares of Lending Club have plunged to just over $5 per share for a loss of 80% while I have made an annual gain of 12% on my investment in peer loans. Has the fallout in Lending Club stock hit bottom and is it now time to invest indirectly in one of the biggest shifts in lending? The table below presents Lending Club statistics for loans issued from 2007 through the third quarter of last year. It is important to look at loans that are more than a year old because the default rate stabilizes after about a year and returns are more certain. Peer loans on average have returned just over 7.2% a year over the period with 6.2% of loans defaulting. The return on p2p investing is as high as 8% for loans in the C-category with default rates as high as 17% in the most risky loans. I interviewed another investor that has been able to generate returns of nearly 12% on peer loan investing through selecting loans based on certain criteria. Be sure to check out how to increase returns in p2p investing. Investing in peer loans is nothing new. Investors have been buying bank loans for centuries and most pension funds hold investments in loans. As financial obligations, risk in bank loans is generally lower than stocks but returns are higher than corporate bonds. Click to get started investing on Lending Club for monthly cash return. Risk on investing in peer lending is very low for the safest categories of peer loans and still manageable even in the riskier categories. As with any investment, you need to understand your own tolerance for risk. If a few defaults are going to make you skittish, then stick with the top-rated categories. If you can ride out a few defaults, understanding that the total default rate will average out over a large portfolio of 200 loans, then you can realize higher returns in the riskier categories. Of course, a lot of the peer loan skeptics point to the financial crisis when peer loans had higher default rates. They argue that there isn’t enough evidence to say peer loans won’t fall apart again in a recession. Defaults on general consumer credit have come down a lot since the end of the recession. The S&P Experian Consumer Credit Default Index reports a default rate of just 1.06% across auto, mortgages and bank card loans it tracks. That is well under the 4.75% default rate it reported in 2010. By comparison, the S&P 500 index of stocks has seen volatility of 11% over the last two years and 20% over the last ten years. That means that the stock market is likely to swing up to 20% higher or lower in a given year. As interest rates start to increase over the next few years, the case for investing in peer loans could grow stronger. Bond returns generally fall when rates increase because the return is through fixed payments. Since peer loans are short-term and not usually traded, they will be less affected by rising interest rates. The potential return on new loans will increase as all interest rates go up. You’ve got a few options investing in peer loans, whether you want to just invest across the safest categories or want to increase your returns by choosing select loans. If you do decide to invest in peer loans, check out these three Lending Club investing strategies for different types of investors. Anyone with money in the stock market since 2000 can tell you that investing can be a roller coaster ride and I doubt it will be any different for shares of Lending Club. As a partial owner in the company, shares entitle you to a piece of the massive growth in the industry. Lending Club’s platform originated $3.2 billion in loans over the seven years through 2013 and it’s now up to more than $11 billion. The peer lending market at about $7.5 billion is still just a fraction of the $3.3 trillion consumer credit market and there are likely years of double- or triple-digit growth ahead for Lending Club. While I was hesitant to jump in and buy Lending Club stock when it was rose to almost $25 in the IPO, I have bought shares recently. I bought 3,200 shares a few months ago when the stock dropped to $3.85 per share. The stock dropped to about $10 per share to the beginning of 2016 mostly as investor enthusiasm slowed on the company. Lending Club was still booking huge growth in sales but investors were coming to the conclusion that it would still be years before earnings would grow high enough to support the stock. In May of this year, Lending Club was hit by a scandal where some data on peer loans was changed before being sold to an investment bank. The CEO resigned and several executives were fired as a result. Since the scandal, the company has recovered and the new CEO is restoring confidence in the business. The shares have jumped to $5.52 per share for a 43% return on my investment, a gain of $5,344 in five months. Unlike investing in peer loans, Lending Club stock is going to rise and fall with the rest of the stock market. By investing in the stock, you get a share of the earnings the company makes off loan originations. Since the company doesn’t hold most of its loans as investment, the stock is an investment in the future of peer lending rather than an investment in fixed-income loans. Peer Loans or Lending Club Stock: Which is the Better Investment? Asking which is the better investment between Lending Club stock and direct investment in loans is something of a trick question. They are two different asset classes and you should probably have a little of both in your diversified investment portfolio. Stocks generally offer higher returns if you can ride out higher risk over the short-term while fixed-income investments like peer loans are more stable and offer near-term cash returns. While Lending Club stock has done very poorly since the IPO, the peer lending industry has a lot of room to grow in the future. It is a legitimate industry and Lending Club is the largest player by far. I have a $7 per share target on my own investment but the stock could go much higher over the longer-term. I recommend adding Lending Club to a diversified portfolio of stocks on Motif Investing. You can group up to 30 stocks and then buy them all for one commission. It lowers your investing risk around any single company and saves hundreds on trading fees. Click to learn more about saving money on Motif Investing. As for investing in peer loans, it is an entirely different investment. Peer loans are a fixed-income investment, paying you a monthly return of interest and principal. Even if default rates increase a little in a recession, returns on peer loans should still be positive versus losses on stocks. Besides positive returns, peer loans also help to reduce the risk in your overall wealth. Using the S&P Experian Consumer Credit Default Index as a proxy for peer loans, we find almost no correlation (0.014) with stocks over the last five years and a very low (0.28) correlation with bonds. This means that not only can you realize high returns on peer loans but, combined with a portfolio of stocks and bonds, you will reduce your risk significantly because all your investments won’t be going up or down at the same time. 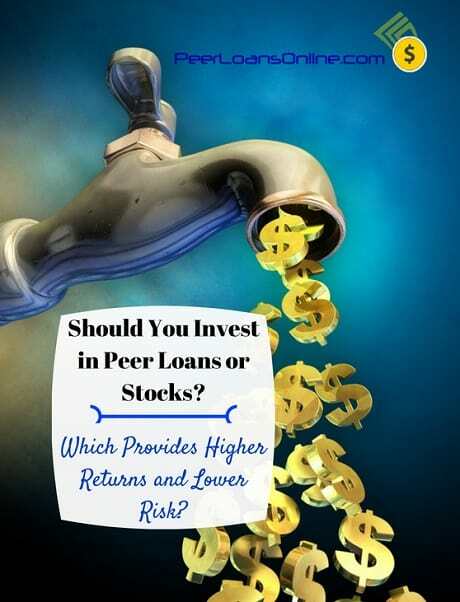 The question isn’t whether you should invest in peer loans or Lending Club stock but how much you should invest in each. That really depends on your age and investing goals. I posted a five-part series on investing by age to help investors understand how much to put in different asset classes according to age.